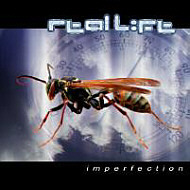 Info: Real Life published Imperfection in late 2003 already, with own coverartwork. In spring 2004 the band came to an agreement with A Different Drum , to release the CD as a special-2CD-edition with new coverartwork by Greg Rolfes and 11 remixes from the bands out of the A Different Drum katalogue, as well as from the band itself, for the American market WAVE IN HEAD decided to rearrange the song "Celebrate" in an electro-retro-style. Real Life, once a famous name in the music busines show, how much they still belong to the top.